Cutting Room Floor: Why all the rain? The land where my grandparents used to live in their motorhome, underwater in June. This morning I missed my bus, so I stopped inside the cafe on the corner to escape the torrents of rain and warm up a bit. It was the kind of rain that pours down your face so fast it stings your eyes, and makes you jump to the inside of the sidewalk every time a truck goes past so you don’t get engulfed in its puddle-waves. My neighbours Val and Steve were there too, and as the three of us looked outside, we got to talking about how crazy the rain has been in Edmonton this month. 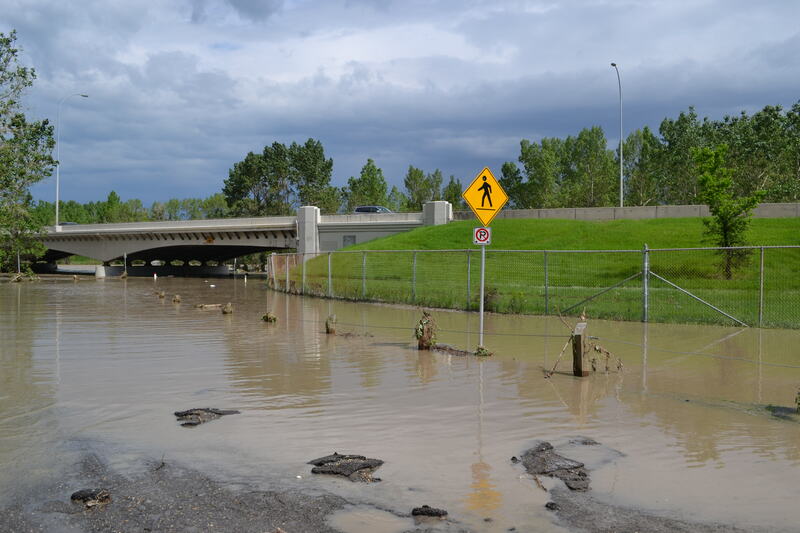 We’re not low enough to experience what Calgary got, said Val, but we might see flooding yet. It reminded me of something that got left out of a radio story I did on the Calgary flood recently, a quote that really sums up something I find hard to understand about these kind of freak, terrible events. I interviewed Shawn Marshall, a climatologist who works at the University of Calgary but lives down the highway in Canmore, and got stuck in Calgary because the roads washed away. And when something like that happens, and you’re thinking about climate change, you can’t help but ask: is this it? Is this horrible event, that forced thousands of people like my grandpa out of their homes, that’s going to draw permanent red lines around some flood plains, is this what climate change looks like? The thing he said, the thing I wished my co-producer and I had room to leave in the story, is that we should think about it upside-down, basically. Rather than standing out in our hip waders and asking the water, “Is this it?”, we should look at the planet and ask, “What’s likely to happen these days?” And our atmosphere, explained Shawn, is telling us it’s getting warmer and wetter. Which means more rain and snow. And more floods. Something to think about as I trundled out in my rainboots today.